Starr King merged here, 07/19/2016. By Worshipful Frank W. Balcomb. We are privileged this evening to celebrate the one hundred fiftieth anniversary of the institution of the oldest fraternal organization in this community. A complete and full history of the preceding century and a half and the events therein cannot be presented in the time and space available; hence a few of the highlights only can be listed here. Jordan Lodge is indeed fortunate in that the period from 1808 until 1895 has been fully treated in the complete and scholarly History of Freemasonry in Danvers, published in 1896 by Worshipful Dudley A. Massev. This massive volume of nearlv 800 pages has over one-half of its contents devoted to the early history of Jordan Lodge and contains biographical material on all candidates through 1895. It is truly a monumental and scholarly work, of which any Lodge should be proud. To continue the style and format to date would be most desirable at some future date if funds and time would permit. On the occasion of the one hundredth anniversary of the Lodge in 1908, a fortv-eight-page bound souvenir program was issued, which devoted some twenty-six pages to a recital of historical records. The amount of charity work done by the Lodge in its earlier days was detailed at considerable length in that printed excerpt of the records. The notes here presented will attempt to inform the reader who does not have access to the above history in a short period of time of the more pertinent facts of our history. Let us, for a moment, orient ourselves to the period of 1808. Thomas Jefferson had only a few months remaining to serve as President of the United States, and his successor, James Madison, had been elected to succeed him. Aaron Burr had that year been acquitted of treason. Robert Fulton had made the first successful application of steam to navigation on his ship Clermont with its imported steam engine. George III was still on the throne of England. Napoleon I had recently landed 100,000 Frenchmen in Spain under the thin pretext of guarding the Spanish against the English, and about this time Charles IV of Spain had abdicated in favor of his son, who in turn had been enticed by this same Napoleon to renounce his throne in favor of Napoleon's brother, Joseph. A rather interesting period it was, in which news traveled slowly and in which men became much interested in the doings of their own and neighboring communities. Naumkeag, now Salem, had expanded, and, as the surrounding territory was settled, communities grew in the outlying parts. Salem Farms, later Salem Village, then became Danvers. The southern part of the town in 1855 became a town in its own right, named South Danvers, and in 1868, in memory of its illustrious son, the London banker and philanthropist, changed its name to Peabody. Jordan Lodge was not the first Lodge in Danvers. United States Lodge had been chartered May 1, 1778. The neighboring Lodges which were chartered later were: Essex Lodge of Salem (March 9, 1779), Amity Lodge, Beverly (September 3, 1779), and Unity Lodge, Ipswich (1779). Philanthropic Lodge of Marblehead, and The Tyrian of Gloucester were, of course, in existence. Of the pioneer United States Lodge little is known. Forty-nine names are recorded as members during its existence. Dissension over a proposed removal to Beverly early led to the formation of Amity Lodge of Beverly. On June 6, 1788, the Grand Lodge voted that the following Lodges be erased: United States (Danvers), Essex (Salem), St. Peter's (Newburyport), Unity (Ipswich), Amity (Beverly), and The Tyrian (Gloucester). That Grand Lodge vote pretty nearly eliminated Masonic Lodges from Essex County! The above vote was passed because of the failure of those Lodges to pay quarterages (dues). On December 9, 1808, a petition to Grand Lodge was signed by Andrew Nichols and nine others for a Masonic Lodge to be located at Danvers. "Brothers Nichols, Webster and Shed to go to Grand Lodge, December 12, 1808 to represent the petitioners." Prior to this petition an association called the Jordan Association had been formed, a code of by-laws adopted. This association was dissolved upon the receipt of the Lodge charter. The charter was granted by Grand Lodge December 12, 1808, although it was not signed until December 20, 1808. Andrew Nichols, a physician who had been raised in Amicable Lodge in Cambridge, was elected the first Master. He was raised in Cambridge while studying medicine with the residents of the famous Craigie House in Cambridge. Andrew Nichols was born in Danvers in 1785 and died here in 1853, and is buried in Monumental Cemetery. He was Worshipful Master in 1808-1814, and 1823-1830 through 1835, a total of fifteen years. Of the other Charter Members, two were raised in Mount Carmel Lodge (Lynn), two in England, one in Norfolk, Virginia, and the remaining four we know not where they were made Masons. If in the older United States Lodge, then there was no record of such, though in at least two cases it could have been possible. Destruction by fire of the records of United States Lodge in 1805 leaves much of this early Lodge in doubt. The first three candidates raised in Jordan Lodge were: Sylvester Proctor, who became the first Treasurer of the Lodge and remained in office twenty-eight years; Joseph G. Sprague, and John Reith. The latter requested leave to withdraw from the Lodge several years later and leave to withdraw from membership was not granted! The number of candidates admitted during the early years was never large in terms of present members but was from seven to twelve, dropping in 1817-20 to from one to three then back to five or six candidates until 1822, from 1822 to 1826, from seventeen to twenty-one candidates in a year were raised. Following 1826, the number dwindled to from one to six per year and from 1829 to 1847 only one candidate was raised during the entire eighteen-year period. From 1847 to 1857 only three or four candidates were raised. Two or three a year until 1863 when following the Civil War ten, sixteen and twenty-two were raised in 1863, 1864, and 1865 respectively. Other large years follow: 1898, 15; 1899, 24; 1954, 18. Following World War I in 1920, fifty-eight candidates were raised and in 1921 fifty-two candidates were raised. By 1833, when we would expect the observance of the twenty-fifth anniversary, Lodge matters were in a poor way. Finances which were then as now based largely on dues (called quarterages then) were greatly in arrears. Promissory notes for amounts due the Lodge were not collectible, and meetings when held were devoted entirely to attempts to make order out of chaos. Regular meetings were scheduled quarterly and not always a quorum was present. From December 25, 1833, to the next meeting on November 12, 1834, eleven months elapsed with no meeting. Thus the twenty-fifth anniversary was really observed in an attempt to keep the Lodge together! The Morgan affair of course had its results but unlike many other Lodges in the vicinity, Jordan Lodge never surrendered its charter. Following the records of the December 1858 meetings, four blank pages appear in the records. These were evidently intended for a record of the observance of the fiftieth anniversary of the Lodge. From the records of the preceding and succeeding meetings we are able to reconstruct the events of one hundred years ago. The earlier Secretary had evidently intended to chronicle in full the observance but never did get to it! A later Secretary added on these pages in pencil, "Note to future historian — such is the procrastination of Secretaries." From the plans for this anniversary and from the committee report, we learn that on Monday, December 12, 1858, Worshipful A. A. Abbott installed the officers following a procession from the hall to the Peabody Institute. Upon the platform were two of those who fifty years before had applied for the charter. Two hymns written by Wor. Andrew Nichols, the first Master of the Lodge, were sung. An address was delivered, followed by a procession back to the hall and "plain repast for the guests." From the records of the next meeting (January 12, 1859), we learn that twenty-five dollars was voted to W. R. Alger for his anniversary address, and five dollars was voted to Reverend Brother Huntoon of Philanthropic Lodge for the manner of conducting the installation. The seventy-fifth anniversary was observed on December 12, 1883. Ninety-six members of Jordan Lodge were present, which together with guests, totaled over three hundred seventy-five. Reverend Edwin C. Bolles, Minister of the First Universalist Church of Salem, and later Professor at Tufts College, was the orator and gave a detailed history of the Lodge. The one hundredth anniversary was a several-day observance with church service, banquet and meeting. Upon this occasion as well as at the seventy-fifth anniversary, the Lodge was favored and honored by a visit from the Most Worshipful Grand Master. To repeat any of the happenings of 1908 is unnecessary at this time because of the existence in print of the program. There are present this evening several who were present upon that most auspicious occasion. Twenty-five years ago the one hundred twenty-fifth anniversary of the Lodge was observed. The Grand Lodge was represented by Right Worshipful Doctor Charles M. Green, Deputy Grand Master. The historical address was delivered by Right Worshipful Walter L. Williams, who was Master of the Lodge in 1908. This good Brother who had planned and labored so hard for the preparation of the earlier anniversary had been obliged to hear about it from a hospital bed, to which he was taken on the eve of the observance. In common with the earlier custom, applicants for the degrees received the degrees but not membership in the Lodge, which was applied for separately and voted by special ballot. Thus we find the names of many who received the degrees in the Lodge but who never took membership therein. Some never applied for Lodge membership and some were not accepted. Fifty-six Brothers were thus raised in Jordan Lodge who never received membership therein. One of the most interesting was the forty-first Brother raised in Jordan Lodge — Maungaudaus, a full-blooded Indian. He and his sons had returned from traveling through Europe selling Indian medicines, and resided for some time in the neighborhood. He applied for and received the degrees but never applied for membership in the Lodge. His date of raising was March 27, 1850. Probably the most widely known Brother to have been raised and a member of Jordan Lodge in its long history was Rufus Choate. This eminent statesman had but recently been admitted to the practice of law and had displayed his sign as a lawyer for twenty-four hours in Salem and decided to move to South Danvers to begin his practice. He was raised January 28, 1824, and served as Junior Warden in 1825. He represented the town in the legislature in 1826-28, and served as Senator in 1829. He was sent to the United States Congress in 1833 and 1849 was selected as United States Senator to fill out the term of Daniel Webster. His career makes him easily the most famous of all Jordan Lodge members. One hundred years later, in 1924 (January 28), a group of Masons, mostly of Jordan Lodge, held a meeting in our banquet hall to honor this famous Brother. Masonic members of the bar were very numerous in their attendance. The address of the evening was given by Brother W. G. Clark, District Attorney of Essex County, and was followed by another by Right Worshipful Frank L. Simpson, District Deputy Grand Master and a law professor. Another colorful figure in Jordan Lodge history and as well in Massachusetts Masonic history was William Sutton. This Brother was a merchant interested in African trading, shipping, military affairs and town affairs in general. His extensive land holdings, nearly two thousand acres in various parts of the county, made him well known, and he served in the Governor's Council in 1853 and 1854. He was born in 1800, raised in Jordan Lodge in 1823, Marshal in 1826, demitted to Essex Lodge in 1845, re-affiliated with Jordan Lodge in 1857, died in 1882. Were the preceding all that could be chronicled about him, his record from a Masonic standpoint would not be unique. He served as District Deputy Grand Master from 1859 for a period of six years and as Senior Grand Warden of the Grand Lodge of Massachusetts in 1866, although never a Past Master of any Masonic Lodge, which has long been a legal requirement for said offices. His many benefactions are recorded and in our jurisdiction one symbolic Lodge, a Chapter, a Council, a Commandery and one of the bodies of the Scottish Rite bear his name. The earlier places of meeting are listed in Massey's history. It should be noted that on October 16, 1857, the Lodge entered into a lease for the rental of Warren Hall as a place of meeting, and the first meeting was held in this hall November 9, 1857, at which time the hall was consecrated to the uses of Freemasonry by the Most Worshipful Grand Master. The Lodge has met in this hall continuously since 1857. Jordan Lodge has never been a large Lodge numerically. Its growth was constant and healthy. In 1913 the membership was two hundred eighty-eight. Following World War I with its great influx of candidates, the 1921 membership was four hundred twenty-three. The depression cast its toll and the membership low was three hundred thirty in 1945. The latest report to the Grand Lodge (1958) reported a membership of four hundred eighty-three members, the largest in the century and a half of existence. In 1858 an epidemic of "not clear" ballots arose which resulted in charges being preferred and the expulsion of one found guilty of not using the ballot in the proper manner. Over the years, Jordan Lodge has participated in the various Masonic events of the jurisdiction: In 1859, it voted to attend the laying of the corner-stone of the monument to the Forefathers at Plymouth; later the Masonic exercises at Bunker Hill; also the dedication of the statue of General Joseph Warren. June 3, 1857, Worshipful Charles N. Ingalls resigned the office of Master (his second year in office) and Brother N. P. C. Patterson was elected to the office in which he served but was never installed. He did not succeed to the office but was elected. However, at the close of the term he was again elected as Master and duly installed. The matter of life membership had long been a matter of much by-law legislation. As early as 1819 the payment of three dollars 8 year for fifteen years would exempt a member from further dues, or as they were called "quarterages." The payment of twenty dollars at the time of membership would also make one an Honorary (Life) Member. Also the third provision of the 1819 by-laws provided that if any member for any number of years paid in advance one-half the amount of fifteen years dues the same result would be accomplished. It is probable that some confusion resulted from these three rather weird provisions relating to the same subject matter, but no further amendment to this section came until 1858 and again in 1866, when what seems to the modern mind as a rather understandable form of payment for Lodge life membership evolved. From the custom of the earlier secretaries to make a list of those present at the various communications of the Lodge, the reader of the records can trace attendance at Lodge meetings. To pursue this custom today would be rather difficult and cumbersome, but for the purposes of historical research, it is most valuable. The earlier custom is generally observed even now in the event of special communications for Masonic funeral service. To make any attempt to cite individuals by name for services to the Lodge would be to attempt an impossible task of evaluation. However, one name must stand out in any compilation of historical data. Brother Frederick Forness, Secretary from 1908 until 1918, has left a most complete record of his tenure, together with many detailed notes also compilations of the voluminous data of the minute proceedings of the Lodge. His clear and handsome handwriting, together with his several note books of data, are of invaluable assistance to the person interested in the earlier years. Members of Jordan Lodge have been active in the establishment of new Masonic Lodges in the communities near their places of residence. As sufficient Masons became available, Lodges were erected. Thus from Jordan Lodge came some of the early founders of Liberty Lodge in Beverly, Amity and Mosaic Lodges in Danvers, Lynnfield Lodge in Lynnfield, New Meadows Lodge in Topsfield, as well as charter members of some of the Lodges in Lynn. A Lodge at North Reading is located in territory served many years ago by Jordan Lodge. One of the Past Masters of Jordan Lodge, Worshipful George Tapley, served as the first Master of Amity Lodge and of Mosaic Lodge, both of Danvers. Andrew Nichols, born November 22, 1785, died March 30, 1853, lived his entire life in Danvers and South Danvers with the exception of time spent in Cambridge while studying medicine. President for many years of the Essex County Medical Society. A founder of the Essex Institute of Salem in 1848; also a founder of the Essex Agricultural Society. Town Moderator 1815-1817. He served as District Deputy Grand Master of the Second Masonic District in 1818 and 1819. His monument in Monumental Cemetery bears the inscription, "Erected by the Friends of Humanity to Humanity's Friend." Samuel Holten Webster, born about 1782 at South Danvers, died October 6, 1812, at Staten Island, New York. Master mariner. Raised in Dundee Arms Lodge, Red Lyon Street, London, England. Joseph Shedd, born at Tewksbury, June 30, 1782, died April 10, 1853, at South Danvers. He was an apothecary and physician and also a justice of the peace. Levi Preston, Jr., born Dec. 5, 1783, died March 25, 1867, in this community. He was a carpenter and builder, having built the Berry Tavern where the early meetings of the Jordan Association were held. He was a director of the Warren Bank for many years. Both of the preceding Brethren were raised in Mount Carmel Lodge of Lynn. Hiram Putnam, born January 30, 1786, at Danvers, died November 8, 1874, at Syracuse, New York. He was a sea captain, retiring from the sea in 1827 and later settling in Syracuse, New York, where he engaged in mercantile and banking pursuits. At the time of his death his property holdings there were very extensive. He received all of the Masonic degrees one evening in Liverpool, England, while his ship was at dock. Benjamin Jacobs, born July 17, 1775, died September 11, 1860, both at South Danvers. He was a master mariner. He was town clerk and selectman for many years. He was raised in Lodge No. 1, Norfolk, Virginia. Col. Benjamin Peabody, born August 1741, in Middleton and died there September 10, 1829. He was one of the two charter members of Jordan Lodge petitioners who were soldiers in the Revolutionary War. It is not known where he or the three remaining charter members received their Masonic degrees. John Shays, born October 28, 1786, at South Danvers, died in Ohio in the fall of 1852. He was a carpenter and upon removal to Ohio was engaged in the pork-packing business. Curtis Searle, born September 8, 1771, at Danvers, died September 12, 1817, at New Orleans, Louisiana. He was a master mariner. Silas Merriam, born March 5, 1737, at Lexington, died January 25, 1812, at Middleton. He was a physician at Middleton. He was the second of the charter members to have been a soldier in the Revolution and was the oldest of the charter members. He was the first of the charter members to die and his was the first Masonic funeral service to be conducted by the Lodge. Two of the charter members, Merriam and Peabody, were men past middle age while the others ranged from twenty-two to thirty-seven years of age. Three were physicians and four were mariners and two were carpenters and builders. Officers in Jordan Lodge, Danvers, 5818. R. W. Joseph G. Sprague, Esq., M.
W. Joseph Shed, Esq., S. W.
W. Daniel Preston, Esq., J. W.
John Preston, Jr., J. D.
Bro. Rufus Choate, S. W.
Bro. Lewis Allen, J. W.
Bro. Rev. Ebenezer Hubbard, Chaplain. Bro. Oliver C. Felton, Sec'ry. Bro. Benjamin B. Tibbets, S. D.
Bro. Fitch Pool, Jr., J. D.
Bro. Andrew Torr, S. S.
Bro. Wingate Merrill, J. S.
Bro. William Sutton, Jr., Mar. Benjamin B. Tibbets, J. W.
Fitch Pool, Jr., S. S.
The members of Jordan Lodge celebrated their 50th anniversary by a public Installation of its Officers, at the Peabody Institution, in South Danvers, on Monday evening, December 27th. The exercises were in the following order:— Voluntary. Hymn, by the late Br. Andrew Nichols.— (This and the last hymn were sung at the consecration of the Lodge, Sept. 26, 1810.) Prayer, by Rev. Br. O. Brayton, Chaplain of Jordan Lodge. Installation of Officers, by Rev. Br. Huntoon. Original Hymn, by Br. H. O. Wiley. Address, by Rev. Br. Wm. R. Alger. Hymn, by the late Br. A. Nichols. Benediction. Nath'l P. C. Patterson, M.
A. W. How, S. D.
Robert B. Bancroft, S. S.
From the Salem Gazette Nov. 13th. On Monday evening last, a new hall, in the Warren Bank Building, was dedicated to the purposes of the Free and Accepted Masons of South Danvers, by the Right Worshipful Grand Master, John T. Heard, Esq., assisted by the Board of officers of the Grand Lodge of Massachusetts, agreeably to the ancient customs and usages of the Order. Jordan Lodge is the name of that which will occupy the new hall, and it now only lacks a year of completing a half century existence. When Dr. Poor, the missionary, left for the Fast Indies, many years since, this Lodge contributed a sufficient amount of funds to educate two Indians, who made a good return for the investment in their subsequent progress—one of them (if not both,) becoming a preacher of Christianity. One of these Indians was named, by Dr. Poor, Jordan Lodge, and the other Danvers. There was a very large attendance of members at the dedication, and also visitors from other Lodges in the vicinity, those from Salem, Marblehead, and Beverly being numerously represented. We believe that on no previous occasion has there been here so large a gathering of the Brethren of the mystic tie; the spacious Hall being completely filled. After the consecration, the Grand Master proceeded to instal the officers elect of Jordan Lodge, concluding the whole with an. Address impressively delivered, and replete with sound Masonic truth and judicious counsel to the Lodge and Fraternity, As a practical matter, it is worth while t6 make more public die caution which he gave against encouraging those wandering pedlars who make a trade of Masonry by selling their wares under the claim of Brother Masons." Benj. R. Tibbetts, J. W.
One of the original petitioners for the Charter of Jordan Lodge was present, Mr. Levi Preston, who, forty-nine years ago, assisted at the organization of the Lodge. There are two or three other survivors, who were prevented by distance or infirmity from being present. At a special communication of Jordan Lodge of South Danvers, held on Wednesday evening, May 6, M. W. Grand Master William Parkman being present, was invited by R. W. D. D. William Sutton, in behalf of the Lodge, to present Past Master's Jewels to W. Bros. Patterson and Tapley, two long tried and faithful Past officers of the Lodge. Grand Master Parkman after congratulating the Lodge upon its long continuance (since 1808,) and exhorting its members to continue in that high-toned devotion to our beloved institution with that zeal which had characterized the founders and early members of the Lodge, addressed himself to Bro. Patterson, in a few pertinent remarks upon the object of Jewels to perpetuate, in lasting material, the records of past services, presented him with a beautiful silver Jewel—to which Bro. Patterson made a very happy and truly Masonic reply. Jordan Lodge of Peabody, Massachusetts celebrated its centennial, December 12-14 in an elaborate manner. The exercises began Saturday evening with a reception to Most Worshipful John Albert Blake, Grand Master and suite. Senior Warden William H. Hill occupied the East in the absence of Worshipful Master Walter L. Williams, who was prevented from being present by illness. A chronicle of the leading events in the life of the lodge was read by Worshipful Joseph F. Wiggin. Remarks were made by the Grand Master and there was singing by a quartette. At the close of the lodge ceremonies the company repaired to the small town hall where a collation was served. Sunday afternoon the lodge, by invitation of the minister, Rev. Will Arthur Dietrick, chaplain, attended worship in South church. Invitations were issued by Jordan lodge to all lodges in the Eighth Masonic District, and there was a large response by members, especially from Danvers and Salem. About 400 Masons attended the service, over 300 marching to the church from the hall. The middle section of the auditorium was reserved for them, and the sides and galleries were filled by the public. The Masons wore their regalia and presented a fine appearance. An open column reached marly from the hall to the church, and through this the grand officers were escorted by the past masters and officers of Jordan Lodge, the rear end of the procession closing up and following the officers of the grand lodge. These officers were J. Albert Blake, M. W. G. M.; William H. L. Odell, D. G. M.; Albert E. Southwick, acting S. G. W; Charles T. Whitcomb, acting J. G. W.; Thomas W. Davis, R. G. S.; Melvin M. Johnson, G. Mar. ; R. Walter Hilliard, S. G. D.; Ernest W. Murray, J. G. D.; Messrs. Smith and Brown, G. St.; Rev. Edward A. Horton, D. D., Chaplain. Major Ira Vaughn of the governor's staff was a guest of the Grand Lodge. The service opened with the call to worship, a responsive service by the chaplain, congregation and choir. The "Doxology" was then sung, followed by invocation by the chaplain, and anthem, and a scripture antiphon, "The light of God," arranged by Mr. Dietrick, in which the chaplain and congregation took part. To a young person a text like this seems sober, looking backward. What are the things that remain. They are something more than specimens in mineralogical cabinets. They are memories that feed the heart-throbs like tributaries to tin' rivulets, and make this dull routine world worth living in. Reverence is the word, cherish reverence for venerable age, for heroism consec crated by martyrdom on battlefield or in council chamber; for mother, teacher, for anybody who has undertaken to do anything in this world and has suffered by it. The rising generation of Masonry must have a due regard for the past. Masonry uses the past to make the present what it ought to be. It teaches its members not only to try to be good but to be good for something. Thus while reverence is the first thing that remains, loyalty is the second. It is an attitude of Masons to be loyal to what they believe. The greatest wish of a true Mason is not simply to be loyal to his own principles but that they, through his devotion, may be impressed on the world at large. Freemasonry means to take all the riches of the past and pour them down into the quickening and uplifting of the world, and to be loyal to that. A man who is a good Mason spreads out and extends that spirit of loyalty to his home. There is no need of drones in the great bee hive of the American republic. Modern society is inclined to produce a lot of pessimists. Young folks who do not know what that word means come under its influence. Masonry has a cheerful, onward look, an ideal and will keep it there. Why is the Freemasonry guide so hopeful? It has the spirit of the Master and is touched with the kindling power of brotherhood. The word for the future is hope. This means more light, and the banishing of ignorance. Freemasonry tries as best it may not only to say these things, but makes a great ark - bearing these precious liberties and truths for all mankind. It tries to give a courage that will give the pulse-beats and heart-throbs of duty, not only for now but for some future. The watchwords, the things that remain, are reverence, loyalty and hope. They stand for character, Christianity and citizenship, for the best things in civilization. Freemasonry tries to stand for all these, and is trying to make a composite type of all elements. It is striving to have a plane, not down, but up, of equality. It stands between mechanical and boodle charity. It is a good stream from which flow many helpful thoughts and sentiments. The closing feature of the celebration was a grand banquet given on Monday evening in the town hall. The hall was decorated in an elaborate manner with flags and bunting. The stage which was occupied by the band was hidden by palms and potted plants so the presence of the musicians would have hardly been suspected if they had not been called on to perform their part of the program. 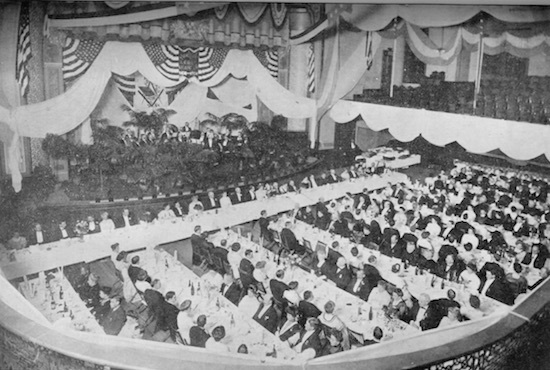 The banquet was preceded by a reception to the Grand officers and their ladies. A long receiving line was formed on one side of the hall, and the members and guests of the lodge were presented by a large corps of ushers. The ladies in the party were beautifully gowned and presented a very smart appearance. At 6.45 the company formed in line and proceeded to the upper hall where the banquet was served. During the banquet the band and a quartette gave a fine concert. About 150 persons were seated at the tables. Following the banquet, which was excellent in every way, came speeches. Acting Worshipful Master William H. Hill presented Worshipful Albert E. Southwick as toastmaster of the evening. Brother Southwick extended a cordial welcome to all, referred to some of the past members of the lodge who had become more or less famous or noted in their generation, and thanked the brothers for their liberal support in carrying out the anniversary celebration. He called in turn upon Most Worshipful John Albert Blake, Grand master. Rt. Worshipful Rev. W. H. Rider, Grand Chaplain, and Worshipful Melvin M. Johnson, Grand Marshal, for responses. These speakers congratulated the lodge on attaining its centennial anniversary, and in pleasant remarks felicitated the lodge on the success of the celebration. Following the speaking an hour's entertainment was given which was much enjoyed. The company listened to the post prandial exercises and the entertainment mainly from the balcony, having deserted the tables after the banquet. All the ladies who attended the banquet were presented with souvenir china plates in commemoration of the centennial anniversary. They were designed and made especially for the event. The men were presented with a handsome little brochure, bound in light blue, with gold lettering, containing a sketch of the history of the lodge and much information in connection with the celebration. These souvenirs will be highly cherished. This page was last modified on 27 December 2018, at 09:53.